Children’s Memorial Park Las Vegas Nv., March 11, 2013 — If you’re strong up the middle, good things can happen – and the USA Patriots were, if nothing else, strong up the middle. 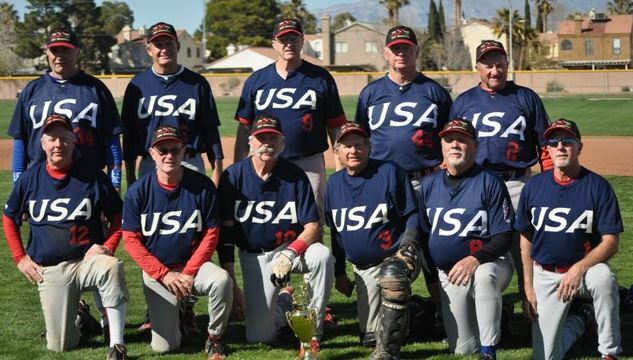 Pitcher Gary Noack threw a complete-game, and Lee Jackson stroked a double and had three RBI to lead the USA Patriots to 10-3 win over the Fresno Grizzlies in the Kickoff Classic 65-and-over title game. Lew Ingalls had two hits and two RBI, and Mike Jones had two RBI in the team’s five-run fifth inning. In what is commonly considered an early-bird tournament where teams can come to shake loose the rust of a long winter, the Patriot’s played as if they were in midseason form on defense. Second baseman Mike Jones and shortstop and team Captain Jacobs turned in a flawless effort through all five tournament games and got plenty of help from first baseman Ron “the Grizz” Williams. Catcher Gary Ewbank, a tournament co-MVP with Noack, caught every inning of the tournament with no errors and no passed balls. The offense was clicking along nicely as well with six Patriots topping the .400 mark. Mike Souza (.500) led all hitters in hits (10)) while Billy Harmon finished 9-for-15 for a .600 average.The Grizzlies had a good run finishing 2-1 in round robin play counting a 13-5 loss to the Patriots in the final round robin game. Bert Avila went 2-for-4 with two singles in the finals. Manny Pacheco was 2-for- 4 with two singles and two RBI. Terry Howarth went 1-for-3with a seventh inning double. The difference in the finals was simple, according to Grizzlies skipper Bob Schiotis – pitching, hitting and defense. Though they didn’t get to tote the trophy of the field, Schiotis said his guys had a lot of fun. Team USA is so named because its players literally come from all over the place. Jacobs is from San Antonio. Alabama, California, and Missouri are represented. And though friendships and the joy of competition may trump victories on an emotional scale for these players, the fact is that they win a lot more than they lose. This was the first time the team played at the Kickoff since 2008. From 2004-2008 the Patriots won five straight Kickoff Classics in the 55-and-over division and compiled a 23-1-1 overall record including 10-0 in the playoffs. Depth is not a problem on the Patriots. Four of its starters had to catch flights home before the finals. Jacobs left early in the game. With the 2013 title in the bag the team is now 28-1-1. “As a group we’ve had a nice run,” Jacobs said. Les Zoltowski contributed to this report.